HERSHEY'S Soyfresh products have gained top recognition in the recent iTQi Superior Taste Award 2016. HERSHEY'S Soyfresh Chocolate was given 2 golden stars award, while HERSHEY'S Soyfresh Cookies 'N' Crème, the top award of 3 golden stars for superior taste and quality. 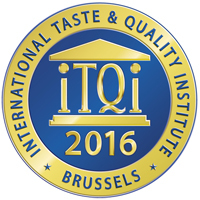 The International Taste & Quality Institute (iTQi) is an independent organization dedicated to testing and promoting great tasting food and drink from around the world. The iTQi jury comprises prestigious Chefs and Sommeliers from 15 nations to identify exceptional, remarkable, and notable tasting products through a rigorous testing regime. The accomplishment of 3 golden stars denotes HERSHEY'S Soyfresh Cookies 'N' Crème’s achievement of more than 90% marks while HERSHEY'S Soyfresh Chocolate was granted the 2 stars by receiving 80% to 90% marks.